Pregnancy is an exciting time. Choosing healthy foods is important to your health and the health of your baby. Pomegranate fruit is a nutritious choice that contains several nutrients important to you during your pregnancy. Eating pomegranate fruit or drinking the juice is probably safe during pregnancy, but as of 2011 it is unknown what effect pomegranate extract might have. It is best to avoid the extract during pregnancy. Talk to your health care provider if you have concerns. 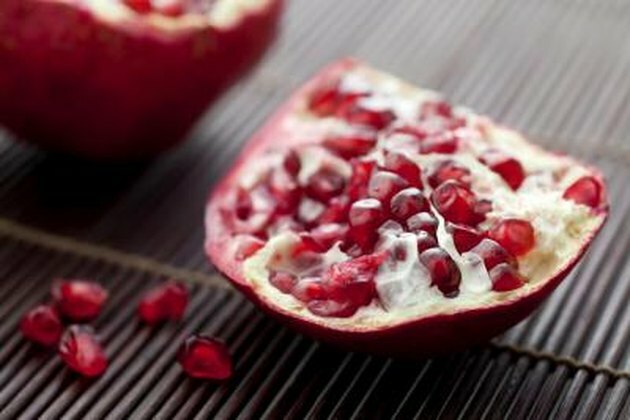 A half cup of pomegranate arils contains 5g of fiber. Fiber is important during pregnancy to help prevent constipation, a problem for almost half of all pregnant women. The American Pregnancy Association recommends that pregnant women consume 25 to 30g of fiber a day. Pomegranate fruit also contains iron and vitamin C. According to the World Health Organization, approximately 18 percent of pregnant women in industrialized countries have iron deficiency anemia. Iron deficiency anemia puts you at higher risk for having a low birth weight baby or preterm delivery and may affect the overall health of your baby. Most health care providers prescribe iron supplements for pregnant women to prevent anemia, but eating foods that contain iron can also ensure that you have adequate iron stores in your blood. Vitamin C improves the absorption of iron, so the vitamin C in pomegranate fruit will help your body absorb more of the iron in the fruit. A study conducted on mice found that pomegranate juice may protect an infant's brain while in the womb. D. J. Loren and associates published a study in the journal "Pediatric Research" in June 2005 stating that pomegranate juice given to pregnant mice decreased brain tissue damage when the offsprings' brains were deprived of oxygen. Pomegranate juice was added to the water of the pregnant mice in three different doses. The pregnant mice drinking the water containing the highest amount of pomegranate juice had offspring with the least amount of brain tissue damage. It is unknown if the same result is true for human infants. According to MedlinePlus, some women use pomegranate to abort the pregnancy. A study in the March 2010 "Reproductive Sciences" found that pomegranate seed extract stimulated uterine contractions in rats. For this reason, it is best to avoid pomegranate extracts during pregnancy. According to the University of Maryland Medical Center, pomegranate extracts contain fruit rind, which stimulates uterine contractions. Eating the fruit or drinking the juice does not have the same effect; therefore, eating pomegranate fruit or drinking the juice during your pregnancy should be safe, states the MedlinePlus. What Kind of Juice Should You Drink During Pregnancy? Is It Unhealthy to Drink Orange Juice While Pregnant?